Dear All, Has anyone created a macro.txt file for batching the process of creating NDVI using Fiji/ImageJ. I have a macro file from Frank Aldious for batching the process but it is targetted for InfraBlue images, but i have Red Filter so this would not work for my case. The macro is listed below. I want to modify it to suit my Modified Infrared Camera with Red Filter. The Photo Monitoring plugin already has a command that generates NDVI from a folder full of images (Single image index processing from directory). You can specify which channels to use for red and for NIR. I also use a red filter and I have no problems running a batch NDVI job with the plugin. Just wondering, why does your macro run a channel split? The macro was developed by Frank Aldiuos, a member of public labs. It basically is doing same thing as processing from the directory where all the parameters are supplied prior. It working well for me now. By the way, which color composition do you prefer when displaying the NDVI values. I have been experimenting with these and found NDVI_VGYRM to be more accurately representing the variations across the field. I'm also using VGYRM although I sometimes have to stretch the NIR value to get good results. I was curious to know which modified camera do you use? For my case, i am testing with Modified Mobius actioncam with wide angle A lens 87mm. If you use the same, can you tell me the white balance settings you use for the better results. I'm using an SJCam 4000, it's a cheap GoPro clone. It doesn't have custom white balance settings so I'm using incandescent with a red filter. I'm also using a Phantom 3 to fly mapping missions with the SJCam mounted on the landing legs. 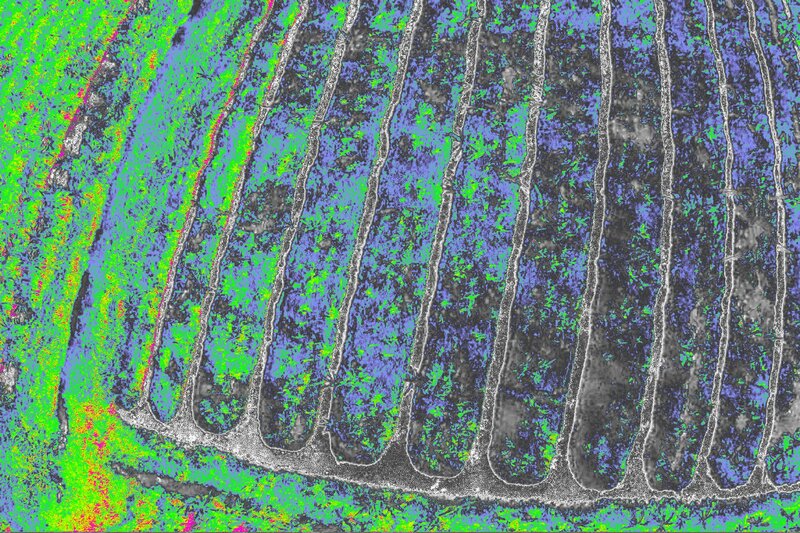 I recently wrote an ImageJ macro to subtract the blue NIR channel from the red channel before running the NDVI processing. It seems to give clearer images with better separation between color values. I think a big problem with these action cameras is the red channel also receives a lot of NIR.